The space saving design of the 9,000-lb. capacity HD-9XW is ideal for vehicle storage in residential garages or commercial buildings. It also happens to make a great service lift for smaller shops who still want to do a big business. No special foundation is required and the installation is a cinch. Optional casters enable you to roll the lift outside or wherever best suits your needs. About the size of a typical parking space, this lift truly maximizes valuable floor area. Use the HD-9XW for detailing; storing ATVs, snowmobiles, jet skis, golf carts, boats or just about anything else that needs to be off the ground. You can finally make use of that wasted vertical space above your car. If you’ve got at least standard 8-foot ceiling, this lift will work for you. Don’t make the mistake of calling the Bendpak HD-9XW Four Post Lift a “hobby lift.” Our expert engineers have packed this model with features that were previously only found on commercial-grade designs. Plus, it’s a BendPak, so you know it’s backed by over 40 years of experience and a reputation that carries just as much weight as our lifts. We’re proud to have these HD-Series lifts in our lineup, and you’ll be proud to have one in your shop or garage. The HD-9XW is the standard version of the high-rise lift. If you are looking for a narrow-width model, consider the HD-9STX. 4 heavy-duty, high-quality, ​galvanized lifting cables and a single hydraulic cylinder mounted underneath the runway makes this lift the most durable, maintenance-free lifting system on the market. 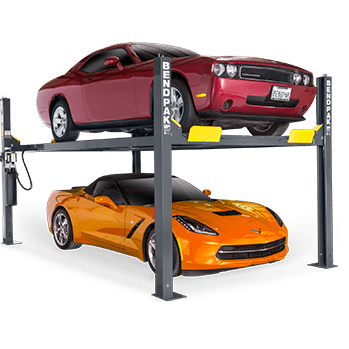 The Bendpak HD-9XW Four Post Lift is equipped with multiple adjustable height locking positions for variable-height parking. A convenient push-button pneumatic safety lock control releases all four independent safety locks simultaneously. Each lift is supplied with 4 high-quality ​galvanized lifting cables, rated at 14,400 lbs. each. The combined rating of these cables is 640% of the maximum lifting capacity of the entire lift! And we make sure it looks tidy too—all lifting cables are fully enclosed within the lift structure itself. 10″ x 12″ base plates provide a solid foundation for the HD-9XW. Take your pick. You’re currently looking at the standard-width, high-rise HD-9XW. The HD-9ST is the narrow model, the HD-9 is the standard-width model and the HD-9STX is the narrow-width, tall model.